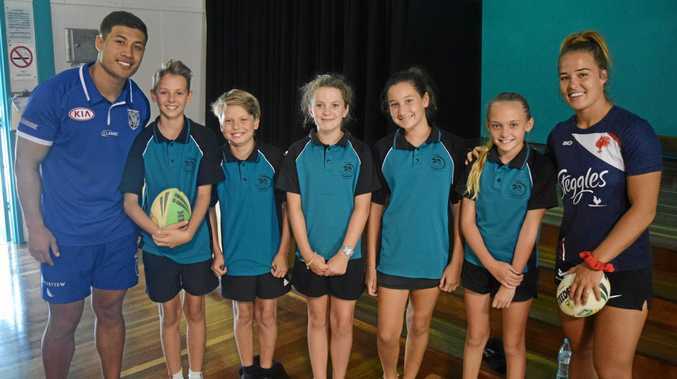 RUGBY LEAGUE: The NRL's Road to Regions tour pulled into a little nook of the Coffs Coast on Wednesday to educate the next generation on the importance of cyber safety. Canterbury Bulldogs utility Fa'amanu Brown and Sydney Roosters centre Isabelle Kelly both addressed the students at Mullaway Public School in an interactive session. The duo had the students eating out of the palms of their hands as they hung on every word. "It's good to get away from training for a bit and raise awareness of cyber safety,” Brown said. Kelly, who is also a State of Origin player and Jillaroo, said social media is a big part of a everyone's lives in 2019, including professional athletes, and students need to be aware of the dangers. "It's really important to learn about it; when I was little I didn't get taught any of this stuff so to go through things that can happen to us and bring it here and teach it to the kids is really good. The NRL is doing a really good job with it. Kelly had the best season of her career in 2018, culminating in winning the Women's Golden Boot Award, and is hopeful she can continue to shine on the big stage this year. "It was unreal (Being a part of the inaugural NRLW season), I can't fault last year at all. For Brown, 24, he's hoping 2019 brings a clean bill of health after suffering multiple setbacks early in his career. "I've had a lot of obstacles that I've had to jump through but I'm looking good this year,” he said. "I've dropped about 8kg the last couple of years and I'm taking it more serious than I have in other years. Member for Coffs Harbour Andrew Fraser and Nationals candidate Gurmesh Singh were also present for the cyber safety talk.